But these numbers hardly even hint at the full story. Arizona’s ESA program can only be used by specific groups of disadvantaged students. In fact, Arizona Department of Education data from 2017 reveals that 82 percent of ESA recipients were students with special needs, from military families, or students from D/F rated schools. The discrepancy between the Republic data and the department data arises from the fact that ESA awards vary between $3,000 and $32,000, based primarily on the severity of a student’s special needs. It is likely that students leaving D/F schools were receiving smaller awards because they were leaving for reasons other than having special needs. Also, just because a student is coming from a higher-performing district does not necessarily mean they are wealthy: School choice critics argue that the ESAs are not enough for low-income families without additional resources to transfer their children elsewhere. But the average account value of an Arizona ESA is $13,431 while the average yearly private school tuition hovers around $10,889. Obviously, not everyone rewarded an ESA will enjoy the same range of opportunities based on the amount of additional resources they have, but there are plenty of low-income families that would have been blocked from even considering other options had they not received an ESA. Wealthy families have long had school choice because they can afford to move to the districts with high-performing schools. Thanks to an antiquated government school funding system that closely ties zip code to education quality, low-income families have been at a disadvantage for decades. When they’re implemented at the state level, school choice programs like Arizona’s aim to give disadvantaged students a chance to break free from their circumstances and attend a school of higher quality than their neighborhood public school. 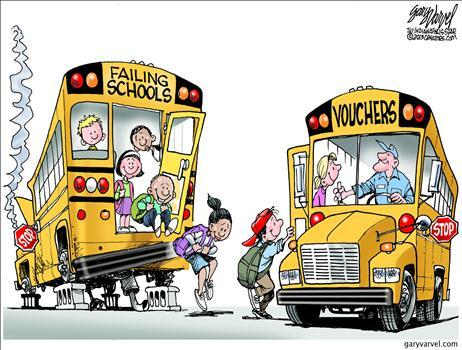 They’re meant to be a solution to the opportunity gap, not a way to make it worse. So what happens in practice? Beneficiaries of school choice programs are mostly low-income and special needs children––and this is by design, not accident. Roughly one-third of existing programs exclusively serve students with special needs. As for programs not intended for special needs students, nearly all of them, nationwide, set income caps ranging from 185 percent of the federal poverty line ($45,510 for a family of four) to 300 percent of the federal poverty line ($73,800 for a family of four). The only cases where students above these income levels can participate are when they are attending low-performing schools. State-level reports also indicate that many participants are far below these income caps––in North Carolina, a 2017 report found that families using the state’s Opportunity Scholarship voucher had a median income of $16,213. In Florida, the average household income of families using the state’s Tax Credit Scholarship Program was only 8.8 percent above the federal poverty line, or $27,308 for a family of four. Compared with the average public school student in the same area, participants in private school choice programs are far more likely to be low-income and minority students. Similarly, charter schools serve disproportionately high shares of minority and free or reduced-price lunch students (a good proxy for determining students from low-income families, since you have to be below 185 percent of the federal poverty line to qualify). There are currently 65 private school choice programs spanning 29 states and the District of Columbia, serving an estimated total of 482,000 students. Additionally, 3.2 million more students are enrolled in charter schools. Over the years, opponents of school choice have claimed that choice programs are “welfare for the rich,”and “just a scam to make private schools cheaper for rich people.” While it’s easy to assume that those in power are cronies using school choice to help out their rich friends, it’s a bit harder to produce facts to back that assumption up. School choice isn’t about leaving poor families behind and doling out favors to those who already have every advantage––it’s about empowering parents to hold schools accountable. If families are happy with their current school, or find newly available options ill-suited for them, that’s fine. But government shouldn’t force families to stay trapped in failing and floundering schools, just because they correspond with their zip codes, when better alternatives can so easily be sought.